Directed by Jonathan Demme. October 2007, USA. PG: 125 min. Successful directors tend to pick one or two genres and stay mostly within their established niches. Alfred Hitchcock had his quirky suspense-thrillers, John Ford crafted panoramic westerns, and Steven Spielberg specializes in big-budget blockbusters with special effects. Compared to these and a boatload of other directors, Jonathan Demme’s interests are all over the place. He made his directorial debut at age 30 with Caged Heat (1974), a women-in-prison sexploitation film. In 1988, he made the comedy Married to the Mob, self-described by its tagline as “The Godfather on laughing gas.” 1991 saw Demme score an Oscar for Silence of the Lambs. Two years later, he directed Tom Hanks in his first Academy Award-winning performance as a gay lawyer dying of AIDS in Philadelphia. This decade has seen Demme become a rockumentarian, with movies about The Pretenders, Bruce Springsteen, and Neil Young, but he’s also maintained his roots in fiction filmmaking with the 2004 Manchurian Candidate remake. More recently, he turned to the political documentary. He spent late 2006 and early 2007 with Jimmy Carter as the 39th U.S. president blazed a trail across America promoting "Palestine: Peace Not Apartheid", a bestselling book called “controversial” and/or “provocative” by no less than 1 gajillion people. 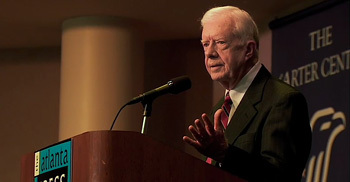 Their sessions together – frequently shot on-the-fly in police-escorted cars, commercial airplanes, and backstage at press conferences and TV/radio studios – along with interviews with a good mix of friends and critics and footage of Carter’s speeches from the 70s to the present, comprise Demme’s latest work: Jimmy Carter Man from Plains. In the book (and in the movie), Carter speaks out against the human rights violations perpetrated against Muslims by Israeli soldiers on Palestinian ground and calls for Israel to vacate Gaza and the West Bank. Building 40-foot walls between Israel and Palestine in order to prevent acts of terrorism might be acceptable, he said. But not if those walls are built miles into legitimately Palestinian territory, separating the nation and restricting access to highways. The documentary does a good job of showing both sides of the debate about Carter’s book, which raised many critics’ eyebrows. Many Jewish critics in the U.S. and abroad, most notably Harvard Law Professor Alan Dershowitz, blasted the book’s message as fact-fabricating and possibly anti-Semitic. They argue that Israel has the right to protect its people and that statistics show the walls around the West Bank have decreased incidents of terrorism. What’s more, they say Carter acts as if Israelis are the party responsible for all the violence. Carter’s defense: Asking his critics if they actually read the book. Read more closely, he says, and they’ll understand that he also laments Palestinians’ attacks on Israelis, too. He sees both sides as responsible for creating a self-perpetuating cycle of violence. The documentary even shows Jewish and Palestinian protesters yelling at each other outside the building of one of Jimmy Carter’s book signings, both sides screaming ignorant hate speech. The Anti-Defamation League was also not too keen on its use of the word “apartheid,” a comparison that they argue trivializes the suffering of both Black South Africans and Palestinians. Carter’s defense: Look up the UN’s definition “apartheid,” and you’ll see that Israel enforces a similar kind of segregation. According to Carter, their court system passed a law that could punish any Israeli or Palestinian spotted riding in the same car with years of prison time. Picking a less charged book title could have prevented many verbal attacks against the former president, who admits that it hurts for various media outlets to call him a “liar, bigot, coward, and plagiarist” for the first time. Maybe he’s at fault for opening himself to such open attacks with his seemingly accusatory title. But at the same time, it’s hard to disagree with Carter that the American media pays more attention to your cause if you spark controversy. Look at U.S. history. Polite, agreeable people rarely inspire change. Sometimes a little outspokenness is what it takes to start a dialogue, and at the very least, Carter should be commended for fostering discussion of the Israeli/Palestinian conflict. Ultimately, Carter just wants peace in the Middle East and will pursue any avenue he can to help it happen. His sympathy lies not specifically with Jews or with Arabs; he wants all parties to thrive. He sides universally with the poverty-stricken and the oppressed, and the movie proves that with clips from Carter in Egypt, Ghana, and post-Katrina New Orleans, as well him discussing the Ethiopian malaria epidemic and his then-upcoming trip to Darfur. I enjoyed and learned a lot from the movie, but its length and editing troubled me. I couldn’t figure out if the movie’s main point was to show the book controversy, to praise Carter for being active in his old age, or to present a full picture of his political and personal life. If it’s the first, then why begin and end with Carter on his ranch? If it’s the second, then why show old footage from his presidency? If it’s the last, then why did his book promotional tour dominate the screen time? We need some scenes added and/or cut to clear things up. I commend Demme for, once again, taking his film career in a new direction and updating Americans on the tireless activism of Carter long after his stay in the White House ended, but he packs Man from Plains with information without providing enough direction. Also, this is minor, but the annoying diagonal wipes and widening-iris transitions reminded me of bad amateur shorts made by high schoolers. There are better and less crappy-looking ways to cut from one scene to another.